Mortgage applications dropped to a 4-year low as rising interest rates are now clearly taking their toll on potential homebuyers. Total mortgage application volume fell 4% last week from a week earlier and plunged 16% from a year ago, according to the Mortgage Bankers Association’s seasonally adjusted index. Higher borrowing costs have come as the Federal Reserve raised interest rates eight times since December 2015, part of a strategy to keep a strengthening labor market from overheating. Turning to the debt markets, yields trended upward along the curve. The benchmark 10-year UST finished 11 basis points higher while the 30-year UST yield was up 7 basis points. Municipals also trended upward with the 10-year MMD 7 basis points higher to 2.77% and the 30-year MMD 12 basis points higher to 3.46%. Source: Thomson Reuters, Bloomberg. 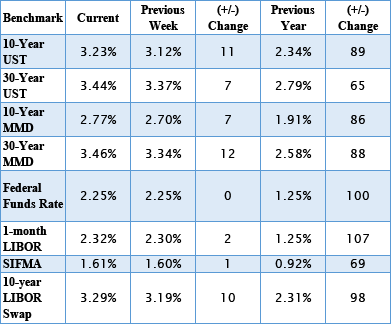 The table above reflects market conditions as of November 6, 2018.